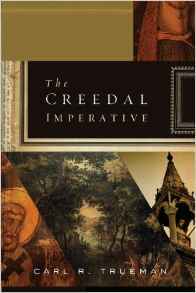 I profited greatly from reading this book, and usually any book by Trueman, even though I am not in the same denomination or “confessional” tradition as he. Trueman is Professor of Church History at Westminster Theological Seminary, and also a minister in the Orthodox Presbyterian Church. He describes himself as a “confessional” Presbyterian and dedicated to that form of church governance. The purpose of this book is to defend the major ancient and historic confessions of the church including The Apostle’s Creed, The Nicene Creed, The Athanasian Creed, and Trueman defends various denominations for having and using their own creeds. fact, he rightly argues that all Christians have creeds, and all churches have doctrinal statements. Though these may not be in the formality of the ancients or Reformers, they do summarize and declare what we believe. Trueman has no time for those who say they have no creed but the Bible. Differing denominations, cults, and even religions claim to believe the Bible and they can’t all be true, and since no one would claim to believe what everyone believes, he must believe in something more specific. Therefore he has a creed. One of the benefits of this book is the encouragement to have a doctrinal statement and a constitution that is specific to what we believe and how we practice. This is only honest and helpful to people looking for a church. I would also propose the same for denominational titles which at least put a church in a particular doctrinal ball park. Trueman also feels that para-church organizations have treated statements of faith too lightly, seeking a sort of connection with all churches, but have then become a mile wide and an inch deep in doctrinal and organizational conviction. The book concludes with a number of suggestions. One is a way to correct the accusation that evangelical Christianity seems often to lack the historical rootedness of a church like Rome. “I believe,” says Trueman, “there is an alternative to Rome: it is confessional Protestantism. . . . I mean true confessionalism, one that adheres to a particular confession and connects this to a particular church order and polity. That is confessional Protestantism as the Reformers and their successors would have understood it.” As a Baptist, I am not always in lock step with Trueman on the official use of creeds and confessions, but I do agree that we all have a creed of some sort and that it is honest to put our beliefs forward, not hide them behind our backs, to both confront and convert a contrary culture.